For the last few years I've always enjoyed reading Rand Fishkin's online marketing predictions for the upcoming year. As Moz has evolved, so have the breadth of the predictions included in each year's forecast. It is fun as well as interesting to get these insights from someone who is so deeply involved in the online space and actually spends time thinking about these things. Unlike most bloggers or other folks who make predictions, Rand actually holds himself accountable by grading the accuracy of his predictions from the previous year. That fact alone makes these predictions a more interesting read - these are thoughtful and educated guesses on the future, not just some random person bloviating (like most talking heads on TV). How many of these authors will do a post-mortem on how accurate they were? Most predictions are hard to get right, especially the further out you look into the future (I'm still not seeing a lot of flying cars despite what I was told when I was a kid). Shorter term forecasts tend to be more accurate. However, Marketing, especially online, is an increasingly more complex and dynamic area that makes it much harder to understand and predict (accurately) what will happen. 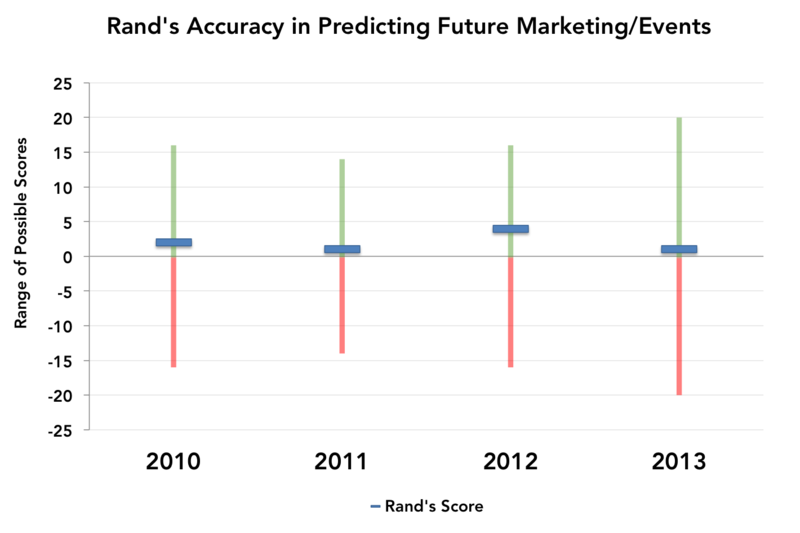 Even someone who is as immersed in online marketing as Rand finds it very hard to correctly predict the next 12 months. Here's a quick plot of Rand's self-graded scores on his predictions. The bars represent the range of possible scores he could get (each year the # of questions vary). He is only modestly above 55% despite being an early pioneer in SEO and being the CEO of an important online marketing software company. To me, this says less about Rand's ability to predict the future and more about the complexity and dynamism of Marketing today. Part of that is because Marketing is growing in its influence and scope. Everyone wants to get in on the game. Another reason is the explosion of data, touch points and opportunities for interaction with customers and building relationships. As technology enables quicker innovation, the future gets more and more blurry when it comes to predicting specific details even if overall trends and patterns do become more clear to us. 2014 is a very exciting time for marketers. It's up to us to not only watch to see what happens, but to make the future a reality. @Rand, I'm looking forward to next year's post (and those that come in between of course).